Claire Wood is a well-known corporate photographer based in Barnsley. She is available to provide a range of photography services across Barnsley and the surrounding area. She has worked with hundreds of companies around Barnsley, providing them with everything they need for the perfect corporate photography to meet their requirements. Claire is very flexible and can travel anywhere necessary to provide the experience you need to have the perfect visuals for your corporate image. Corporate photography can be arranged for any company in Barnsley, no matter what the size. Claire caters to everything from small family-owned businesses to national organisations and even international bodies. If you’re not convinced about her photography skills you can head over to her blog which showcases the amazing work she has completed for her many happy clients. If you’re based in Barnsley and require corporate photography for your business, give Claire Wood a call on 01484 512484 or drop her an email at mail@clairewood.com to discuss your requirements. There hasn’t been a brief yet that she hasn’t been able to meet or even exceed the expectations of the client. Below is an example of Claire Wood’s corporate photography in Barnsley and you can find many more examples on her blog or corporate photography gallery. 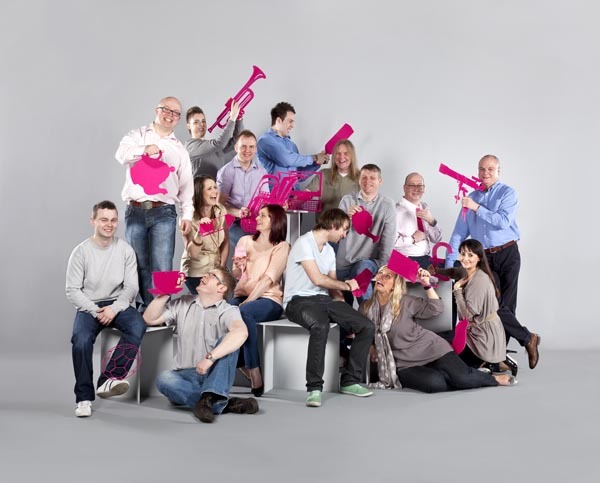 “I found the perfect way to do a fun group staff shoot and show off their ‘cutting’ abilities. I often take the studio’ on location and this was actually set up in a corner of their factory. No expensive studio hire!” Cutting Technologies in Barnsley, Yorkshire.